Pamětní deska Editě Sedlákové odhalena! Ve čtvrtek 2. března byla slavnostně odhalena za přítomnosti synovce Edity Sedlákové, Michaela Hermanna s rodinou a příbuzenstvem jejího manžela Zdeňka Sedláka pamětní deska na domě v Nerudově ulici číslo 19 v Plzni, kde Edita se svoji rodinou před začátkem II. světové války žila. 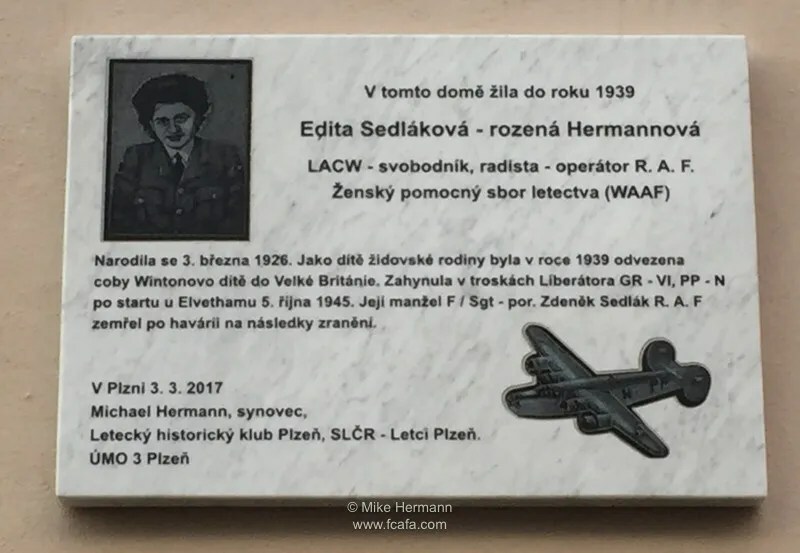 On Thursday, 2nd March a Memorial Plaque was for Edita Sedláková unveiled in the presence of her nephew, Michael Hermann with his family, and relatives of her husband Zdeněk Sedlák on the house at 19 Neruda Street, Plzeň 3, where Edita and her family lived before II. World War II. Vzpomínkového aktu se zúčastnil starosta městského obvodu Plzeň 3 Radislav Neubauer, zástupci Krajského vojenského velitelství v Plzni a zájmové složky reprezentovali Svaz letců ČR – Letci Plzeň, Letecký historický klub Plzeň, Československá obec legionářská a Český svaz bojovníků za svobodu. Attending the ceremony was Rostislav Neubauer, Mayor of Plzeň 3 District, representatives of the Regional Military Command in Plzeň and representatives of Svaz letců ČR – Letci Plzeň – the Association of Czech Airmen – Airmen Plzeň, Letecký historický klub Plzeň – Plzeň Aeronautical historic club – Československá obec legionářská – Czechoslovak Legionnaires and Český svaz bojovníků za svobodu – Czech Union of Freedom Fighters. After a welcoming speech by Vaclav Toman, the event continued with a presentation by Michael Hermann about the life of his aunt. “When Edita was 13 years old she left on a Winton train to London. When she had reached 17, she entered the WAAF unit in the Royal Air Force RAF. „Jak po fyzické tak po odborné stránce byla hodnocena velmi dobře. Zřejmě prodělala výcvik ve středisku Bridgnorthu, kde se školily budoucí radistky operátorky, který úspěšně dokončila. Vystřídala několik leteckých základen a byla zařazena k 311. čs. bombardovací peruti. Zde se seznámila s palubním mechanikem F / Sgt. Zdeňkem Sedlákem za kterého se provdala. Ale osud byl k Editě velmi krutý.” řekl Michael Hermanna a pokračoval. “How physically and professionally was very good. Apparently he underwent training at the Centre Bridgnorth, where he schooled the future radio operator operators who successfully completed. 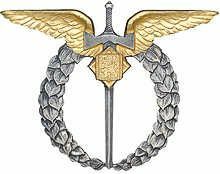 Replaced by several air bases and was assigned to the 311th MS. Bomber Squadron. There she met a mechanic on board F / Sgt. Zdenek Sedlak she had married. But fate was to Edita very cruel. “Said Michael Hermann and continued. Her mother died in 1944 in Auschwitz concentration camp. On 5 October 1945 six months after the war had ended she was onboard a four-engine Liberator aircraft of 311 Sqn for a repatriation flight from Blackbushe airfield to Prague – Ruzyně, with twenty-three repatriate passengers on board. Sedláková’s husband was among them, and Edita was to finish her RAF on 14 November. They were going on their honeymoon. At 12:43 minutes the aircraft, with index PP-N, took-off and once airborne the engines on the left wing caught fire and Kudláček, the pilot decided to return to the airfield. The aircraft suddenly veered into a left turn, hit the ground and exploded. The flight had lasted a matter of seven minutes, and now 23 people had been killed,” concluded Michael Hermann. 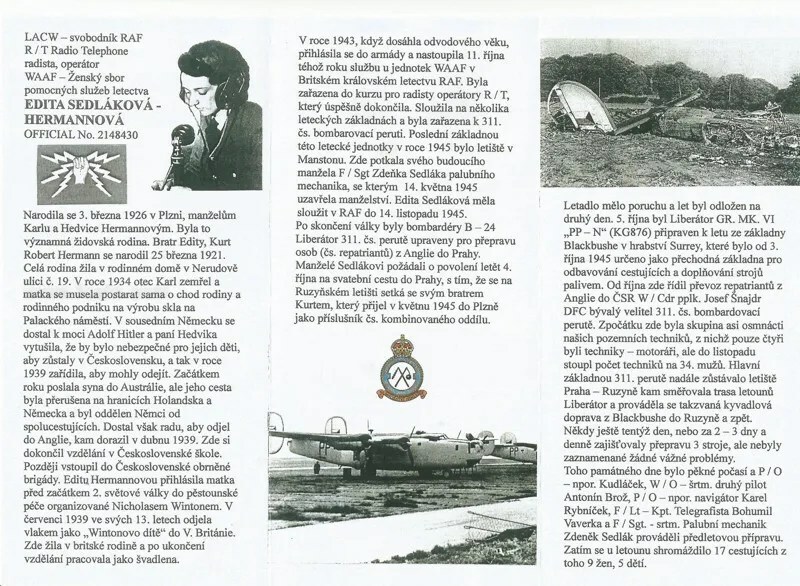 Ladislav Vitík, místopředseda SLČR – Letci Plzeň pohovořil o vojenském ženském sboru WAAF v RAF. 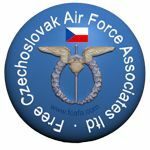 Ladislav Vitík, Vice-president of Svaz letců ČR – Letci Plzeň – the Association of Czech Airmen – Airmen Plzeň talked about the WAAFs in the RAF. Jaromir Kopačka, President of Letecký historický klub Plzeň – Plzeň Aeronautical historic club – together with Václav Toman presented to Michael Hermann the Medal of Merit for Edita Sedláková “In Memoriam. Then followed the unveiling of the Memorial Plaque. Následně hosté položili květiny a zazněly hymny Velké Británie a historická Československá. 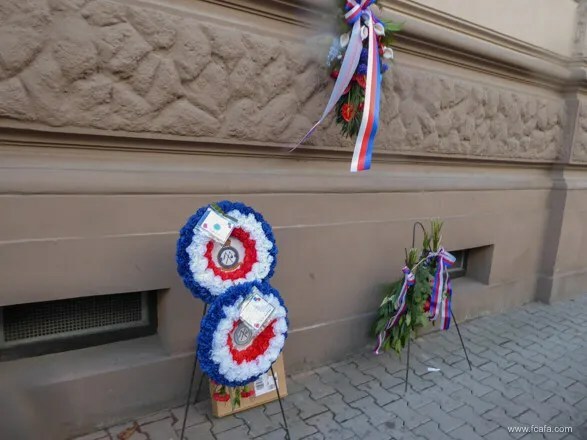 Dignitaries and guests then laid wreaths and flowers and the event concluded with the playing of the National Anthems of Great Britain and historic Czechoslovakia. Thank you to everyone who made this such a successful event. Very special thanks to Vaclav Toman without whom this would not have been possible. The attendance of Vendy, the granddaughter of Zedenek’s brother, together with her sister and family was wonderful. Also the attendance of Carol Noble and Vic, who presented a wreath on behalf of fcafa.com, was greatly appreciated. 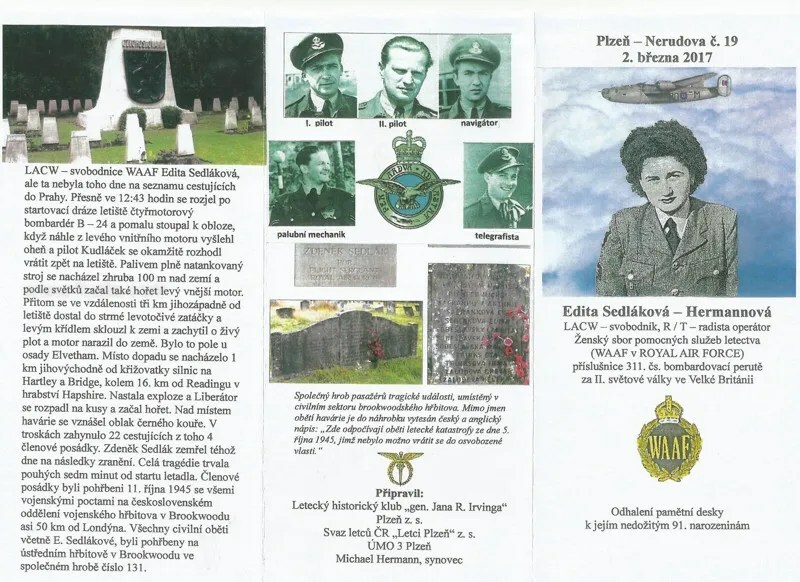 Many thanks to all who have helped in this project to remember Edith, Zdenek and their families.